In my last blog post, I’ve talked about my journey to Japan. If you’re keen to know how that was like, you can read about it here. If you’re planning to visit around Tokyo, make sure to get a PASMO or SUICA card at the ticket machine once you’re at the airport (Haneda International Airport or Narita International Airport). This is the type of card that is widely used for transportation such as buses and trains. The reasons why you should get it there are because the airport is the language buffer zone in which other people can still understand you if you speak English (sometimes Mandarin) and these ticket machines are not widely available. They’re both very similar but if you’re interested in knowing how they differ, you can read about it here. 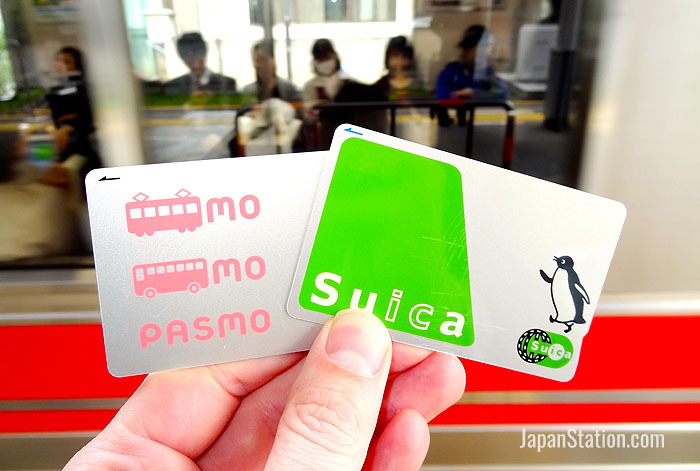 The PASMO and SUICA cards. Image courtesy of japanstation.com. They can also be used like a prepaid card at some of the restaurants. I nicknamed them the Alipay of Japan. The vending machine outside of a restaurant. My first impression of Japan was deceived by my experience at the airport. It seemed to me that every single Japanese person is very well-versed in English. I was dead wrong. The moment I stepped out of the airport, I started to have communication problems with the local people. This was totally different from what I’ve found on the internet saying that most people living in Tokyo are well literate in English. I couldn’t even make use of Google Maps since I had just received my SIM card (from the company Mobal) and it had not been activated yet. I was lucky to even find the place that I’m staying now at the time of writing this post. But that’s mostly thanks to Mrs Naomi because she was walking around that area searching for me. Japanese people are really polite and helpful. I remember walking into a supermarket operated by an old couple and checked out items worth around ¥2,000 using a ¥10,000 note. There was not even a sign of resentment on her face. In my country (Malaysia), the cashier would probably have rolled his/her eyes at me. Shame on you! On the contrary, she kept on saying ‘arigatou’ (Japanese people bow when they say this which literally means ‘thank you’). That’s how I developed the ‘Bowing Syndrome’ because I felt obliged to do the same whenever someone who’s older than me is doing it. Graphical depiction of me and the security guard who don’t speak the same language. Drawn by Michelle Majalang (Follow her on Instagram). Nonetheless, the security guard brought me to the right area (That’s so kind of him). So first, make sure you have Google Translate and Google Maps installed on your smartphone. The route suggested by Google Maps is very accurate in Tokyo according to my experience. The reason why you should have Google Translate is pretty obvious because this is the app that you’re going to use whenever you want to convey a message to a Japanese who doesn’t know English. Oh, make sure that you have Japanese keyboard installed as well because they’ll have to type it out to be translated into English if the message is too complicated to be expressed by using body language. It can also translate Japanese words in pictures which is very helpful since most of the Japanese goods only have Japanese letters on them. If you don’t even know the slightest bit of Kanji (which is essentially Chinese words and they often have very similar meaning), you’ll have to rely on Google Translate most of the time. And if you’re overconfident with your proficiency in Kanji, you’d end up like me. I mistook sesame oil as cooking oil and bought it home. It could have been worse if I didn’t know Kanji because their osake (rice wine) looks exactly like cooking oil! Text after translation. It also shows that Google hasn’t perfected this technology yet. Shinjuku Gyoen Park is one of the most beautiful parks I’ve ever seen in my life. It boasts the greatest greenhouse I’ve ever seen but too bad, it falls short in size. The park does indeed live up to its rating of 4.5 on Google Review. This sums up everything that I want to share in this blog post. See you guys on my next blog post.